Formally Goddard Catering Group, GCG Group is a leading provider of airline, industrial and event catering services in the Caribbean and Latin America. It is a member of the Goddard Enterprises Group of Companies, and oversees three divisions of its own: GCG Catering, GCG Ground and GCG Events. 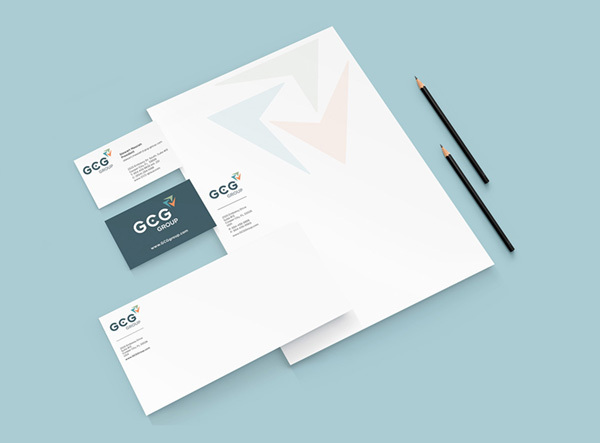 When the company sought out our services, we were originally tasked with designing just two logos: one for GCG Ground Services and one of GCG Catering. However, we quickly realized the branding for the group of companies was not only inconsistent, but failed to establish a relationship between each division. In fact, the parent company did not exist at all. Rather than put a bandaid on the situation and complete solely the requested logos, we opted to use the opportunity to give the companies a complete brand to fall back on — and thus GCG Group and its aptly named subdivisions were born. With a naming strategy in place and approval from the company itself, we began the branding process for each division. Our talented designers presented the leadership team with an array of options. They ultimately decided on a group of logos that incorporated similar arrows, while communicating a message specific to that particular brand. For instance, the icon for GCG Events is an abstract version of a server’s hand holding a tray, while the GCG Ground icon represents an airplane taking off. 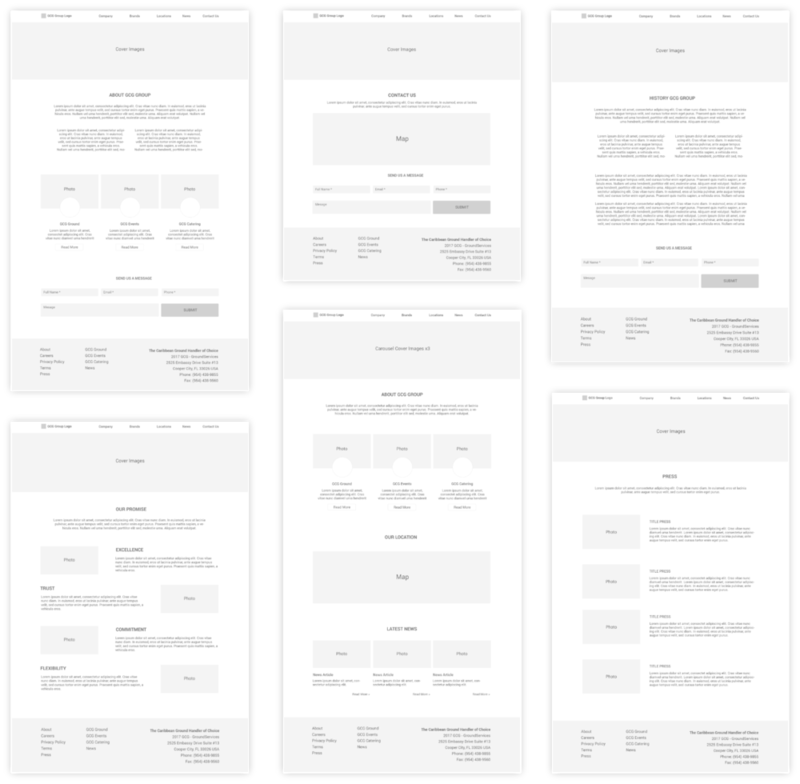 Once the brand was approved, we created extensive and incredibly detailed brand guidelines. With 35 different locations, each had a wide array of materials to which branding would be applied. This step was key for ensuring inconsistency would not be a problem again in the future. From there, it was decided that GCG Group and each of its three divisions would need a dedicated site, and so our team got to work. We designed, wrote, and built four unique websites, due to launch in the near future. Simultaneously, our team took the reigns for GCG Group’s and GCG Events’ social media marketing. Before we began managing the accounts, there was no strategy guiding the existing accounts, and thus the brand was being misrepresented on several social media platforms. To rectify this issue, we recommended consolidating the many accounts for each location. Now, GCG Events has a single account on both Facebook and Instagram, while GCG Group has one account on LinkedIn and one on Facebook. All accounts are guided by a thorough strategy to ensure consistent brand messaging. Backed by a cohesive new brand, GCG Group has set the stage for future growth in terms of clients, employees and even locations. The relationship between the parent company and its subdivisions is now clear, allowing for more recognition within each specific industry. The company has also witnessed an increase in social media engagement since our team took over, and we’ve only just begun. As our partnership progresses, we hope to continue to build upon GCG Group’s success and help solidify the group of companies as the premier provider of catering and ground services.